And yet, after seeing this little spark I wonder if Irving didn’t wonder if he’d spent his career being passed over for comics with less talent? When I say “watched” I mean all 85 excruciating minutes! There should be an award for that. Back to Irving in a moment, I’ve got to tell you about the movie first. It’s a musical comedy in Technicolor. 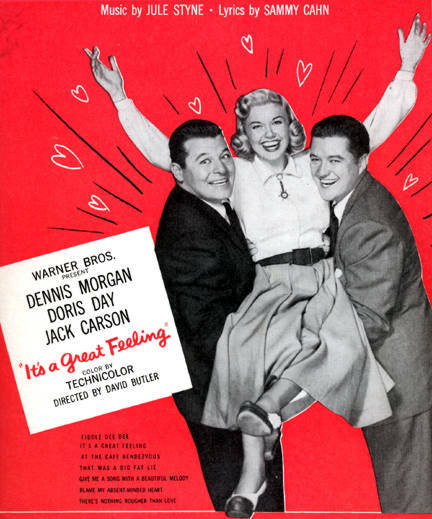 It starred two actors well known in 1949 Hollywood, Dennis Morgan and Jack Carson. They play themselves in a plot that revolves around discovering Judy Adams, a waitress at the commissary (played by 27 year old Doris Day) and casting her to star in a film. Doris was a major babe. She was also a pretty good singer and excellent comedic actor. “Doris Day movie” somehow got an undeserved bad connotation over the years. This movie is bad in spite of Doris, not because of her. In his on-camera outro TCM host Robert Osborne explained it was made on the cheap in only six weeks to fulfill a promise to theater owners. Filmed on the Warner Brothers lot it was filled with famous stars in cameos. Unfortunately it looked thrown together and pointless. Maybe you could get away with some of this in 1949, but it just didn’t age well. Back to Irving Bacon. He stole the movie! From IMDB: A minor character actor who appeared in literally hundreds of films, actor Irving Bacon could always be counted on for expressing bug-eyed bewilderment or cautious frustration in small-town settings with his revolving door of friendly, servile parts – mailmen, milkmen, clerks, chauffeurs, cabbies, bartenders, soda jerks, carnival operators, handymen and docs. There were and are dozens on Irving Bacon’s in Hollywood. There is a demand for dependable and pliable! Irv’s role was small. He played a Los Angeles Union Station railroad clerk who knew everything about every train by heart. When the principals in the film came by one-by-one asking about a train to Gerkey’s Corners, WI he was forced to bring out his schedule books and look it up. He was irked. He never needed to look things up! Each time he was forced to find a tiny additional piece of info he burned just a little more. By the time a ‘normal’ railroad customer came and asked where the men’s room was he was so stressed he just punched the man’s lights out! There’s not a lot written about Irving Bacon. IMDB credits over 400 movies and TV shows to him. That’s crazy. The man was never out of work. And yet after seeing this little spark I wonder if Irving didn’t wonder if he’d spent his career being passed over for comics with less talent? I’m over 60 years late, but I’m now an Irving Bacon fan. 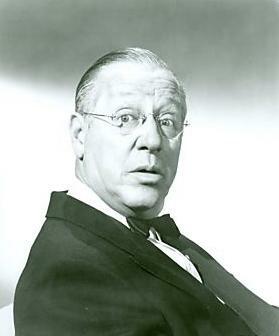 I always called Irving Bacon “the man who is in every movie” without knowing his name or anything about him. He always seemed to turn up until it became something of a game to look out for him, like Alfred Hitchcock’s cameos.